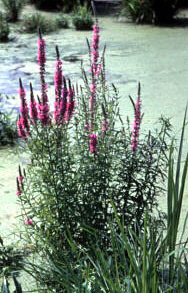 Purple loosestrife is a wetland plant with showy purple flowers arranged on flower spikes. Leaves are lance-shaped with smooth edges and grow up to four inches long. They are usually arranged in pairs opposite each other on the stem, and rotated 90 degrees from the pair below. Leaves sometimes appear whorled (radiating out from a single point) around the stem. A recognizable feature is the square-shaped stem, which is generally four to six-sided. A single plant is made up of multiple woody stems. Individual flowers have five or six pink-purple petals surrounding small, yellow centers. Single flowers make up flower spikes, which can be up to one foot tall. Flowers bloom from early July through September. Purple loosestrife spreads primarily by seeds. When flowers drop off, capsules containing many tiny seeds appear in their place. Depending on location, plants may go to seed as early as late July. Each mature plant can produce up to 2.7 million seeds annually. As tiny as grains of sand, seeds are easily spread by water, wind, wildlife and humans. Germination can occur the following season, but seeds can also lay dormant for several years before sprouting. Purple loosestrife produces thick, woody roots. On mature plants, roots are extensive and can send out 30 to 50 shoots, creating a dense web. Pieces of the roots and stem fragments can also produce new plants. Purple loosestrife is a perennial plant found rooted in a range of wet soil habitats. It can grow in a couple feet of water or on dry shore near the water line. It is commonly found in roadside ditches. Plants range from two to six feet tall, with several half to one foot long flower stalks on a single plant. Plants bloom from early July to September, and then go to seed. Purple loosestrife is native to Europe and Asia. The species was unintentionally introduced to the United States’ Great Lakes through contaminated solid cargo ship ballast as well as through the deliberate importation of seeds. The first discovery in the United States was in Lake Ontario in 1869. Purple loosestrife was sold and planted for decades as a decorative ornamental plant. However, due to its negative impacts on native plants and its ability to escape from cultivation, purple loosestrife is illegal to sell in most states. It looks similar to many native, beneficial wetland plants found in Minnesota shoreland areas and wetlands. Purple loosestrife (Lythrum salicaria, L. virgatum and any combination thereof) is listed as a MDA Prohibited Noxious Weed (Control List) and a prohibited invasive species in Minnesota, which means it is unlawful (a misdemeanor) to possess, import, purchase, transport or introduce this species except under a permit for disposal, control, research or education. Dense growth along shoreland areas makes it difficult to access open water. Dense root systems change the hydrology of wetlands. People spread purple loosestrife primarily through the movement of water-related equipment and uninformed release of garden plants. The plant produces millions of tiny seeds in shoreland areas. Seeds can be hidden in mud and debris, and can stick to boots, waders, and other fishing and hunting gear. Roadside maintenance equipment can also spread this plant and its seeds. Follow the “Play, Clean, Go” best management practices to prevent the spread through terrestrial systems. Report new occurrences of purple loosestrife to the DNR immediately by contacting your DNR Invasive Species Specialist or log in and submit a report through EDDMapS Midwest. Mechanical control can be done using hand-held equipment like a shovel or weed puller, but is labor intensive for large stands. Hand removal is recommended when dealing with individual plants or very small stands. Mowing is not recommended as plants will likely re-sprout and seeds may be spread. Herbicide control can be done using glyphosate herbicides. An aquatic herbicide formulation is required if treatment is to be conducted on or near water. Biological control can be done using four species of beetles which are well-established biological control agents in Minnesota. These beetles solely eat purple loosestrife, and are a good control option if the stand of purple loosestrife is at least one acre in size or larger. Biological control insects released between 1992 and 2002 have established reproducing populations at more than 90% of the release sites visited. The long-term objective of biological control is to reduce the abundance of purple loosestrife in wetland habitats and, if effective, will reduce its impacts on native wetland flora and fauna. Talk to your local invasive species specialist if you are interested in collecting and releasing beetles at a site. The best time to collect beetles for biological control is in late May or early June. Is purple loosestrife in your garden?